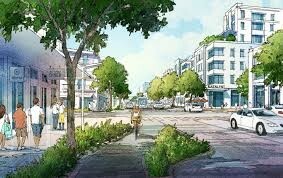 An historic agreement has been reached between leaders in the Miami Beach preservation community and developers to support a voter referendum that would increase FAR – the maximum allowable size of a building – in the Town Center district of North Beach. In turn, Tatum Waterway and Crespi Boulevard will be put back into the proposed North Beach Local Historic Districts. Both actions were recommended in the North Beach Master Plan, the Town Center as a means to revitalize the area and the Historic Districts to maintain its character. Since the Master Plan’s acceptance by the City Commission last fall, Tatum Waterway and Crespi Boulevard were exempted from the Local Historic Districts and proposed as a Conservation District, a designation with fewer protections, after concerns were raised about their vulnerability to sea level rise. But dividing the historically designated areas created unease among preservationists who were less willing to support changes to allow for a denser Town Center. Town Center was proposed as a means of bringing much needed revitalization to the area, a walkable hub of retail stores, restaurants, and offices with the potential for attainable housing. The agreement was reached between Daniel Ciraldo, Executive Director of the Miami Design Preservation League (MDPL), and the MDPL Advocacy Committee; Nancy Liebman, founding member of Miami Beach United, former City Commissioner, and member of the Historic Preservation Board; and Matis Cohen, President of North Beach Property Owners Association. This is the first time in the history of MDPL that it has supported an increase in FAR since a City Charter amendment in 2001 requiring voter approval for inceases. The City has already adopted one portion of the Master Plan increasing height to 125 feet in the Town Center. The ballot question follows the Plan’s recommendation to combine the three TC districts into one and increase FAR to allow for larger buildings. FAR measures density and is determined by taking the total gross area of a building and dividing it by the area of the lot. Allowable FAR varies by zoning district with the least intense FAR being 1.25 in the RM-1 residential district. Currently the TC districts range from 2.25 to 2.75 in allowable FAR. The ballot question would increase FAR to 3.5 in a combined TC District. The Town Center area is located between 69th and 72nd Streets from the West side of Collins Avenue to Bonita Drive, an area that generally has deteriorated over the years. This morning the City Commission voted unanimously in favor of a resolution supporting “implementation of the entirety” of the North Beach Master Plan and, in effect, supporting the agreement. Ciraldo, who is out of town, sent a letter of support to the Commission. "This is the result of a hard fought compromise with North Beach stakeholders that would include our support for the FAR increase in North Beach Town Center together with the Commission's support to place the Tatum Waterway back within the local historic district," Ciraldo wrote. "Such a compromise is a win-win for the community and will result in the effective implementation of the consensus North Beach Master Plan." Cohen said the process was initiated by Commissioner John Alemán with Arriola stewarding the agreement. “Both worked diligently to ensure this would come to fruition,” he said. Alemán said, "This is a good resolution to really confirm the handshake of the Master Plan which is that compromise between the natural tug of development, redevelopment and historic preservation." Despite the milestone achieved today, it’s not a done deal. Voters will have the final say in November. Since a 2001 amendment to the City’s Charter, any increases in density require voter approval. In 2015 voters denied an FAR increase for Ocean Terrace but with both powerful groups aligned, the odds get a little better and, presumably, they will work together to educate voters on the advantages of the FAR increase. Regarding the concerns about sea level rise for Tatum Waterway and Crespi Boulevard, the Commission resolution calls for continued efforts to create development regulations “that reflect the character of these neighborhoods, while taking into consideration resiliency and sea level rise”.